Agilent Technologies Inc. (NYSE: A) recently announced the latest release of its industry-leading, low-cost, high-performance software for RF and microwave board design, Genesys 2012. The updated software provides enhancements in RF system simulation (including electromagnetic, circuit and statistical simulation), plus features to help designers improve the reliability of their systems. Genesys 2012 simplifies analysis of RF systems with multi-stage conversions that enable system architects to easily visualize spurious signals across a broad frequency sweep. Along with its unique root-cause-analysis capabilities, Genesys now gives RF system designers unprecedented power to quickly determine the source and path of spurious frequencies across the entire frequency range of the system. This enables efficient troubleshooting of the system architecture and frequency plan during system design, before hardware implementation. That, in turn, eliminates costly hardware rework during system integration. "Meeting designers' demands for improved RF system design functionality remains a key consideration for Agilent," said How-Siang Yap, Genesys product manager and planner in Agilent's EEsof EDA organization. "Genesys 2012 is the result of customer feedback obtained during our longest early access program involving the largest number of users the program has ever had. The feedback guided development of the Genesys 2012 release, resulting in useful features such as a configurable auto-save function to protect Genesys designs from computer or network failures." 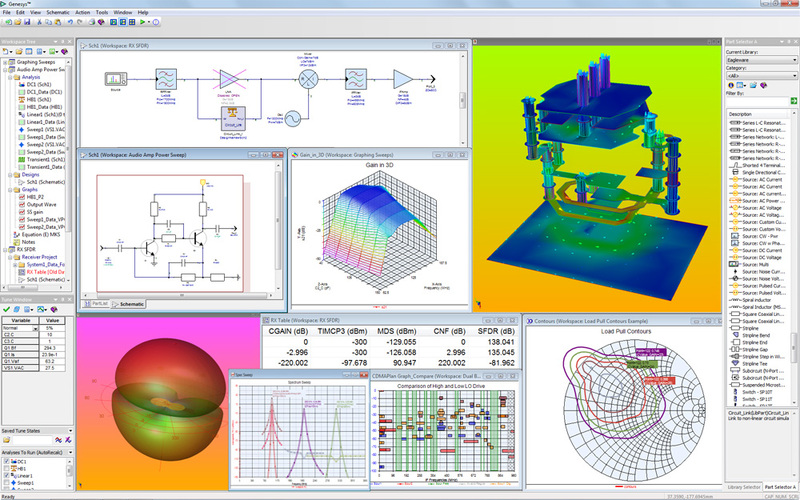 Genesys is the most affordable high-performance RF and microwave design software in the industry. The 2012 release delivers significant improvements to the planar EM simulator Momentum GXF, including a quadrangle mesher to efficiently mesh a planar layout with the fewest number of unknowns. The result is a fast, high-capacity EM solution. Genesys 2012 also provides a one-click link to Agilent's EMPro software for immediate full 3-D EM simulation without having to redraw the structure, assign material properties or port locations. Genesys 2012 provides the industry's widest coverage of circuit synthesis applications to tackle tough designs such as custom notched filters and wideband matching networks. It enhances accuracy and convergence to its circuit simulators by incorporating passivity enforcement in passive models. Monte Carlo statistical analysis results can now be exported into a spreadsheet for further analysis and reporting. The Genesys 2012 release is now available for download. Pricing for the software starts at less than $4,000. For information about the Genesys RF and microwave design software, go to www.agilent.com/find/eesof-genesys. Photos of the Genesys 2012 software are available at www.agilent.com/find/eesof-Genesys2012_images.